Sveti Klement is an uninhabited island in the Croatian Adriatic and part of the Palinski Archipelago. It lies a mere three and a half kilometres from fashionable Hvar (twenty minutes by boat). The coast is quite rugged and the interior covered in Maquis shrubs. It is largely virgin territory. This is a wonderful place to escape with its deserted beaches, rosemary fields and a lovingly created nature reserve full of exotic plants. Diving is a popular pastime, there are many antique shipwrecks around the coast which may be easily discovered. The sea itself is a treasury of diverse fish, coral and underwater landscapes. The island also boasts a marina which is regarded as one of the safest harbours in the Adriatic. The best places to stay on Sveti Klement provide the visitor with all the peace, tranquility and seclusion that the island has to offer. Nothing here for you? Extend your search and check out the best places to stay in Hvar or all our recommendations on the Dalmatian Coast. Alternatively contact one of our friendly gurus for advice. A boutique collection of bungalows on a beautiful island retreat. Colour-themed mini villas have an eclectic mix of modern art and traditional furnishings. 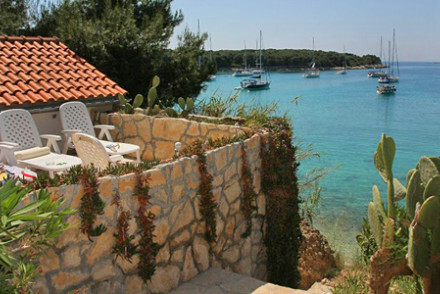 Stunning views over the bay, two excellent Mediterranean restaurants, and water taxis to Hvar. Ideal for honeymoons, families, and good value. Honeymoons - Complete privacy from charming villas on a tiny island retreat. Families - A great place for children, the beaches are shallow.